Week of Love: Get Amora, Wedding Garb & Rings with Your Beloved! Description: Spin the wheel of Luck to win Incinerator, Amora, Angelina, Seraph's Stones, and many more! - The prizes include Amora's Seal, Amora's Seal Shard, Seraph's Stones, Lvl. 3 Holy Crystal, Angel Tears, Aegis Shards, and Blessed Stone. - It will cost 1 Jackpot Lotto Voucher for each spin. Jackpot Lotto Vouchers can be obtained from the events Daily Login and Total Recharge Rewards, and by purchasing with Diamonds. - For each spin, you will receive 1 Wheel of Luck Point. - When your Wheel of Luck points hit 20, 50, 100, 300 and 500, you can claim some Jackpot Lotto Vouchers from the Wheel of Luck menu. - You can spend points to make purchases in the Shop of Luck. Angelina's Icon, Lvl. 3 and 5 Common Gem Chests, Lvl. 3 and 5 Superior Gem Chests, Ruby Herosouls, Lvl. 4 Cherubstones, Lvl. 3 Holy Crystals, Lvl. 3 Warsoul Seeds (L), and Lvl. 3 Gold Seeds (L) can be bought there. - Daily Top 10 players who have at least 60 points will get extra Synth Scrolls; Daily Top 10 players who have at least 120 points will get extra Seraph's Stones. - At the end of the event, the Top 10 players who have at least 250 total points or 600 points will get extra rewards as follows. Description: Host or attend the wedding party to get romantic items! Description: Log in every day and get Jackpot Lotto Voucher! Description: Recharge every day and buy romantic items at a discounted price. Description: Reply the Facebook post with the screen shot of your guild's Facebook Group to be qualified. Then Like & Share this post for your chance to win a FREE Ring of Revelation on 4/12! 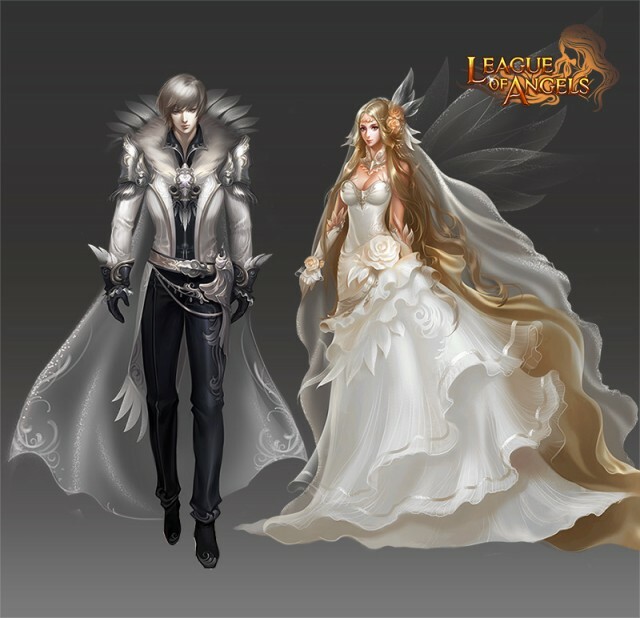 Description: post the photo of your in-game or real life wedding party to win Element Dust and Seraph's Stones!